You are cordially invited to the 2017 International Conference on Unmanned Aerial Vehicles in Geomatics UAV-g 2017. This is the fourth event of the series UAV-g Conferences following the very succesful meetings in 2011 in Zurich, Switzerland, in 2013 in Rostock, Germany and in 2015 Toronto, Canada. 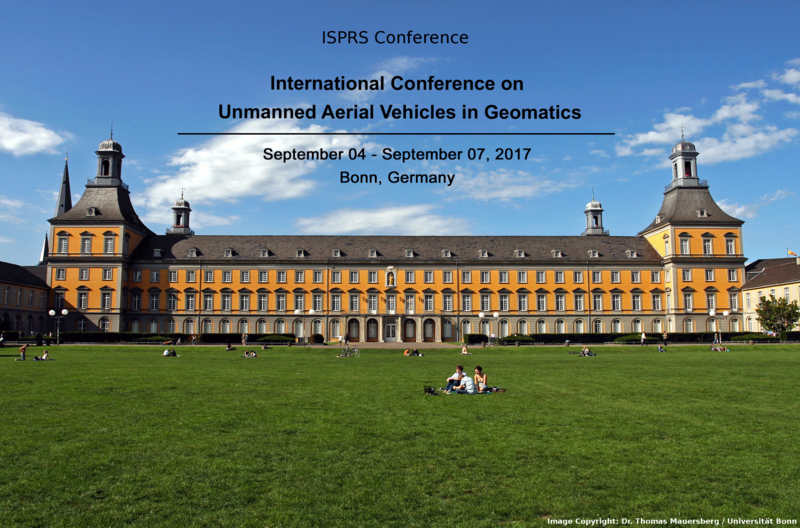 The UAV-g 2017 is an ISPRS event. Using small Unmanned Aerial Vehicles (UAV) as data acquisition platforms and autonomous or semi-autonomous measurement instruments has become attractive for many emerging applications.The aim of UAV-g 2017 is to bring together experts in photogrammetry and remote sensing, surveying, robotics, computer vision, artificial intelligence, aerospace engineering, geosciences and various UAV user communities. UAV-g is a great opportunity to learn about the most recent developments and to exchange views on the future directions of UAV in geomatics research, applications and services. Please visit the Call For Papers. This Special Issue will also feature selected papers from the UAV-g 2017 conference. Authors wishing to have their work considered for this issue, including those not able to present at the conference, should contact the guest editors (see call for papers).